Unlike the Samsung cards, Sandisk charges a substantial premium for not buying through Amazon. “High Endurance” means it’s rated for 5000 hours of “Full HD” recording, which they think occurs at 26 Mb/s. The Fly6 records video in 10 minutes chunks, each weighing about 500 MB, call it 1 MB/s = 8 Mb/s, a third of their nominal pace. One might reasonably expect this card to outlive the camera. This entry was posted on 2017-11-28, 07:36 and is filed under Electronics Workbench, Photography & Images, Recumbent Bicycling. You can follow any responses to this entry through RSS 2.0. Both comments and pings are currently closed. Not sure I understand what you mean when you say Sandisk charges a premium for not buying through Amazon. 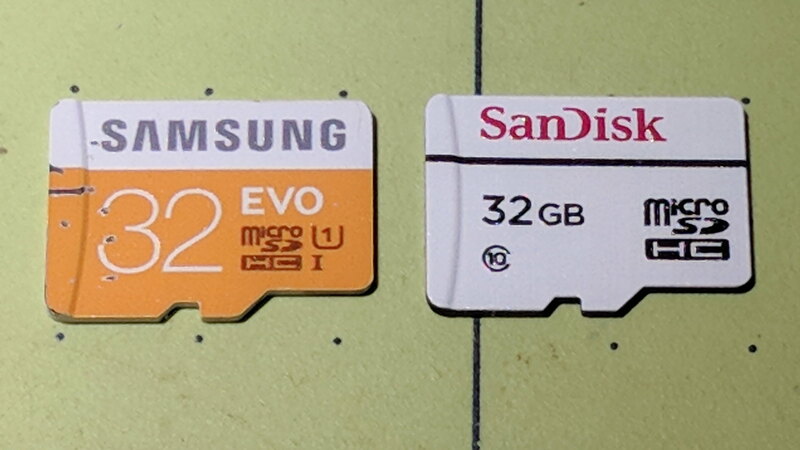 Perhaps it’d be better to say Amazon sells Sandisk MicroSD cards at a substantial discount and sells the Samsung cards at MSRP. Given that Samsung also offered free shipping, I bought their cards direct to get known-good merch at the same price.